Mrs. Rani Subramanian came to Bhagawan Baba as early as 1950. Fondly called 'Rani Maa' by Bhagawan, her life was a treasure-chest of scintillating experiences that she shared with eager devotees. She is the author of ‘A Pilgrimage to the Realm of Peace’. The Rani Maa Series on Radio Sai and the Heart2Heart special ‘Mesmerising Moments With the Divine Master’ are extremely popular with listeners and readers, and have been translated into several languages. 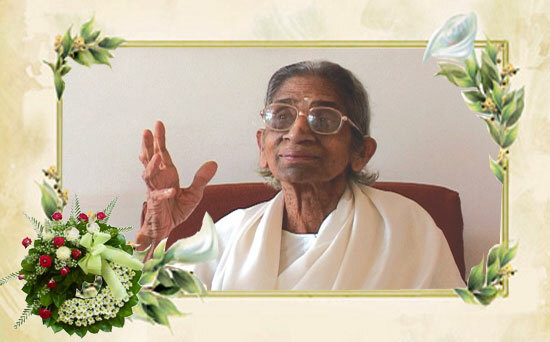 She lived her last years in Prasanthi Nilayam and passed away on 1 December 2012. Until then, she continued guiding and uplifting devotees despite her deteriorating health. The flames engulfed the pyre and made her body disappear forever. In the backdrop, the hills were steady as a rock, the river had run dry, the goats were about their business of grazing and the Sun was shining as the wind blew away the smoke that arose from the flames, returning her to the unknown realms of the universe. Although we mourned the loss of Rani Maa, it was her moment of release and to those left behind, the end of an era. Having come to Swami way back in 1950, she, like a generation of devotees, had strived to make the spiritual path their sole objective. There never existed another way of life for them. That she was imperfect and yet strived every moment towards that inner perfection; that she had troubles but faced them with a brave Spirit; that she faltered but gathered the wisdom to march on; that she was human but persevered always to be His Divine Spark – all this and more makes her an inspiring devotee of our Beloved Swami. After Swami’s physical departure, every time I was down and completely lost, I had a place to hide and find comfort. My visits to her – that gave her so much security as they gave me spiritual strength - will remain etched in my memory. She was desperate for freedom towards the end, and time spent with her was a hands-on lesson on the cycle of life – the perishable body but the imperishable Spirit – and above all, the grandeur of a life committed to the Spiritual Way. The Godmother arrives when the soul is ready for its journey towards the goal – God. She nurtures us like the mother tortoise, who nurtures her children just by looking at her young ones from the bank across of the river. A person of her caliber is rarely to be seen. She was a pathivratha, a great mother to her children and her sister’s children, an ardent follower of Ananda Moyi Maa and a gem of a devotee of our Beloved Bhagawan. During the numerous hours spent in her company, she would lovingly and enthusiastically share her countless experiences with Swami, interactions with Spiritual Masters and what it takes to tread the challenging yet fulfilling spiritual path in life. One of the things that struck me most was just how peaceful I felt in her presence, taking my mind far away from worldly thoughts and worries. In every meeting, she spoke of Swami and what it meant to follow Him. According to her, we were doing her a service by helping her re-live those glorious times with Swami. Her obedience in following His word was most impressive. His word was law unto her and an important teaching from Swami that she followed was to always keep your word. If you say something, you have to mean it and always follow it. And she practiced that to perfection. She always abided by Swami’s instructions that came from within. Despite all the odds, she practiced smiling all the time and till the last moment even in her semi coma state she wore a sweet smile! She kept reminding us what Swami had told her - that this life is just a dream and that whatever happens we should just be a witness. Swami advised her long back to pray for Manas Shanthi (mental peace) instead of asking for promotions, cures and the like. So she guided us to pray for Manas Shanthi, Griha Shanthi and Vishwa Shanthi (peace for the mind, peace at home and peace in the world). Satsangs with Rani Maa were a treat – for both the listeners and for her. Swami willed that she speak to small groups only and as always, she religiously followed His command. We can only learn to love by loving. I met both Rani Maa and her sister, Sarju Maa in 2001 through a friend and it was then that I saw what it meant to live the way of Sai. Both lived very simple and exemplary lives. From the very first time I met them to the countless hours I spent with them, I will always cherish how loved and inspired I felt in those moments. The only thing that truly matters is the Godward path, they said, and it has to be lived cheerfully! For this path to be real it has to be natural and ingrained, it cannot be a chore. They made the choice joyfully, followed it to the hilt and never looked back. She strove ceaselessly to realise this truth until her last breath. Although the above article is in first-person narrative, it is a compilation of personal reminiscences by several authors who were close to Rani Maa aunty.